How in the world are we already at the end of February?! It seems like it was just Thanksgiving last week! I was holding on to winter because Oklahoma City hadn't gotten any snow days, but after last week's winter weather craziness, I've officially decided that I'm ready to transition to spring! Transitioning between seasons is always so fun to me - I get to pull out clothing items I forgot I had, switch up my color schemes, mix and match unexpected pieces and bare some skin! I'll need a spray tan first, though, ha! 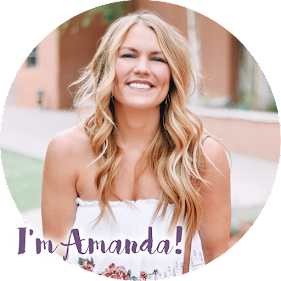 I thought I'd share a few of my favorite ways to transition between winter and spring...scroll on down to check 'em out! All I can hear is, "Florals for spring? Groundbreaking." from The Devil Wears Prada, ha! But really, you can't go wrong with it! I've been wearing dark florals or mixing my lighter florals with a darker clothing item (like this $14 bodysuit) since it isn't 100% springtime just yet. It helps me feel cheery and spring ready but while still being suitable for winter. I'm also a fan of floral print sweaters or sweatshirts! I posted about my love for wearing bright colors in the winter here. I think it is such a welcome relief after the holidays to add some color back into your wardrobe! I love to mix neon green with grey or hot pink with tan (or leopard!). You can also wear pastels if you don't like to look like a highlighter - I love a good baby blue in late winter. It feels soft and snowy without being too Easter-y. Probably my all time favorite way to dress. Chunky sweaters and cut-offs are my jam! I have really big quads so jeans aren't always the comfiest for me.....the first time I can let my quads breathe in the spring will be a magical day! Also, while we're on this topic, I just want to say that I was the college girl wearing Ugg boots, bootie shorts and a Northface, and I 100% still support that fashion choice. No shame in my game. During the holidays, velvet, sequins, silk and metallics are all the rage. 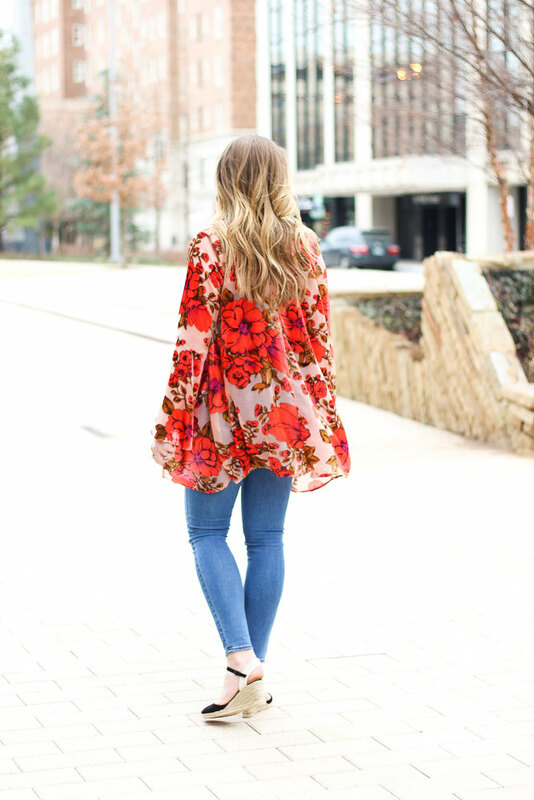 You can transition those fabrics to spring by mixing them with spring textures like I did here with a velvet body suit and a sheer, floral kimono. I also love pairing florals with stripes! A dark, winter outfit can instantly be made "springy" by adding the right accessory! Bright/light scarves, colorful jewelry, straw purses...even a pair of colorful shoes or wedges! Again, mixing and matching is key! What are your favorite ways to transition your closet to spring? According the Mr. Groundhog, we still have a few more weeks of winter, so I'm all ears! Thanks for reading, loves! I hope you have a wonderful week.